Vaughn Harper’s Last Radio Broadcast On Air ~ An Historical NYC Radio Event. 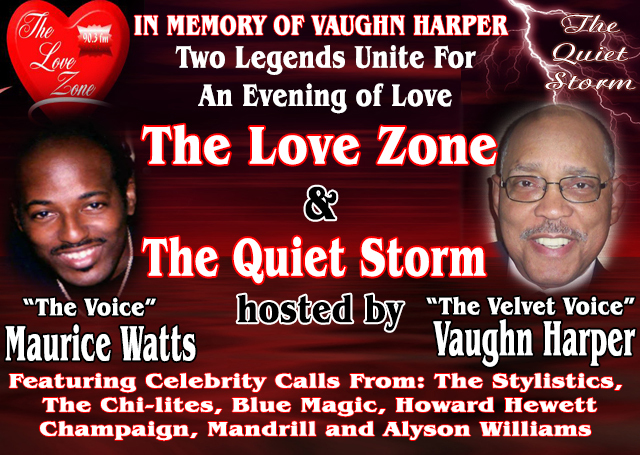 In memory of the “Velvet Voice” Mr. Vaughn Harper. A special broadcast recorded October 8, 2010 when NYC WHCR 90.3FM radio host Maurice “The Voice” Watts invited Vaughn Harper to join him on air for a radio special featuring both hosts playing music for their combined listening audience. Includes celebrity call ins from The Stylistics Russell Thompkins Jr, Pauli Carman of Champaign, Ted Mills of Blue Magic, Marshall Thompson of The Chi-lites, Rick & Lou Wilson of Mandrill, Howard Hewett and Alyson Williams. This is truly a collectors item for any NYC listen.